Tilak Ceremony is one of the most important Pre Wedding Ceremonies; it holds an important position as regards its auspicious nature in traditional Hindu customs. The Tilak Ceremony varies from one state to another. It is also very different in case of diverse castes and creeds. Among the tribal in India, the Tilak Ceremony holds good, but the way is quite different from its urban counterpart. According the family tradition and culture the Tilak Ceremony is usually held. Tilak which is also the sign of auspiciousness is generally put by the male members of the groom's family like uncle, cousin, brother by using Kumkum, the red vermillion. Generally the female members of the family do not put this vermillion. The ceremony is usually held in the groom's residence but it is often held in temples so that the groom gets a blessing from Almighty, to prosper from his marriage, have a wider scope, opportunities and have an altogether improvement in life. For example according to the Sikh Mythology it is very essential that the Tilak Ceremony is held in Gurudwaras, so that the chief priest may also recite a hymn to make it more auspicious for the groom. After the commencement of Tilak Ceremony the bride's father offers gifts to the groom and also to all other members of the family. Ranging from fruits to clothes, goods and sweets the gifts are regarded as propitious and are distributed among the different members of the groom's family. In exchange of these gifts, the groom's father sends sugar, coconut, rice, clothes, jewelry and henna to the bride's family to be distributed with much merriment among the members of the family. Generally the relatives of the groom's family carry the objects to the bride's house with much gaiety. It is regarded as sacramental for the bride's family as well. Offering tilak in the forehead of the groom ensures a loving husband for their child, who would take care of her and also shoulder her responsibility all along her life. It is said that marriages are made in heaven, only to be conducted on the earth and truly, the Tilak ceremony speak volumes about the Indian customs. 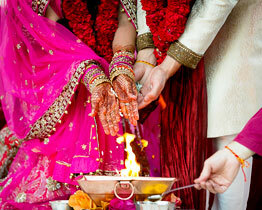 Another form of Tilak Ceremony is the Chenky ceremony in which the bride and her mother do not attend the ceremony. But the male family members along with other members of the family are allowed to attend the ceremony and joyously participate in the function accompanied by lively dance shows, music and often vocal music from traditional Indian customs. 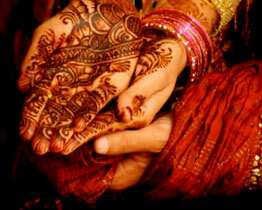 Sometimes the Tilak and Mehendi Ceremonies are held together. This is especially done in order to reduce the cost and to make the hassles of two consecutive ceremonies for both the bride as well as the groom. This merging also makes way for more entertainment and joyfulness. Tilak Ceremony is therefore one of the most important Wedding Ceremonies in India, which is the most grand of all the Pre Wedding Ceremonies. 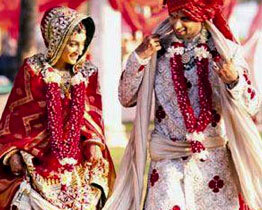 Indian Weddings signify much more than decorations, fineries, entertainment, wedding planners, mehendiwalis and flowers. First and foremost it is the union of two like minded hearts. 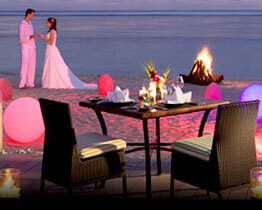 Wedding is a special occasion for both the bride and the groom. Wedding Ceremonies in India consist of several rites and rituals, starting from the Pre-Wedding Ceremonies and ending in the Post Wedding Ceremonies. Indian Marriages are said to involve maximum rituals, traditions and vibrancy otherwise absent in any other marriages around the globe. Celebrated by the Bride's family, the Mehendi Ceremony is an amusing ritual observance that derives its origin from the Traditional Indian customs. 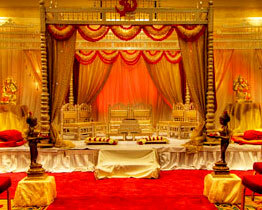 Indian Weddings signify much more than decorations, fineries, entertainment, wedding planners, mehendiwalis and flowers. Most importantly it is the union of two like minded hearts. If you witness the Wedding Ceremonies in India, you will be overwhelmed by the diverse shades of customs, religion and beliefs that these ceremonies offer. Indian wedding ceremony itself is a long and stretched out procedure when almost all the Hindu deities are worshipped besides asking them to bless the newly wed couple.